This patient has an inferior STEMI. This ECG is normal sinus rhythm, with a P wave preceding each QRS. The normal PR interval is 120-200 ms; this PR is prolonged at 249, consistent with first-degree AV block, a generally benign finding. But that is only an incidental notation on this ECG, as there are major abnormalities in the ST segments inferiorly. The inferior leads, II, III, and aVF, are limb leads which reflect changes at the inferior aspect of the heart, typically with blood supply from the right coronary artery. Further confirming the diagnosis is ST depression in lead aVL, called a reciprocal change, increasing the concern for inferior STEMI. Atrial fibrillation is an irregularly irregular rhythm without defined p waves, not present on this ECG. Multifocal atrial tachycardia is often present in patients with COPD, and though irregular and fast, there is a p wave preceding each QRS. Third-degree AV block is confirmed with P waves which are not associated with the QRS complex, usually with a rate in the 30s. WPW is defined by a short PR segment (not present here) and a delta wave which is a gradual upsloping of the initial reflection of the QRS complex, often seen in the lateral precordial leads such as leads V5 and V6. 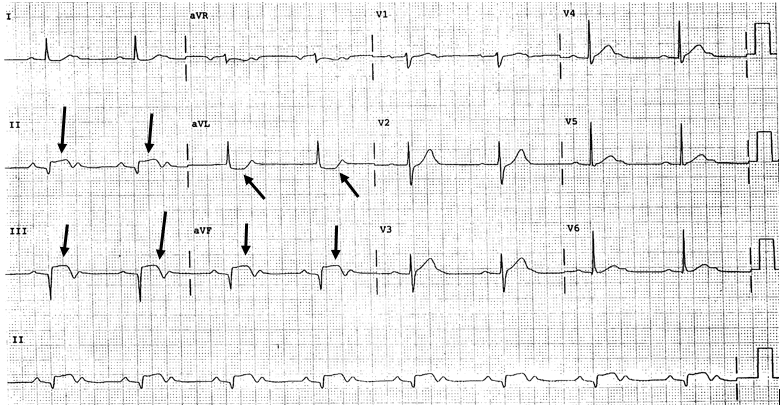 This ECG shows an inferior STEMI with reciprocal changes as well as first-degree AV block. The downward facing arrows show the ST elevation indicating and inferior STEMI. The upward facing arrows highlight the reciprocal changes in lead aVL.